Hey everyone, so I thought I would mix things up a bit and do a post more personal to my life, usually I'm writing about the things I love, but never an insight to what I get up to.. Every day is very different for me, more so now I have my little man, but we are in somewhat of a routine. 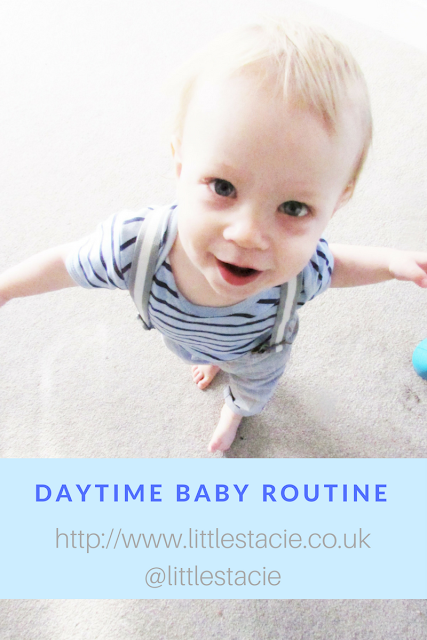 I've read a lot of other day/night baby routines posted by fellow mums and I know each baby is different so I thought I would share ours! Rise and shine - 6:30am is around the time Luka usually wakes, most mornings I here him chatting away and laughing in his cot it's the cutest, honestly! Once we're both up I make his first bottle of milk whilst he plays with his toys and then he ends up drinking it at 7ish. After his first bottle he will sometimes go back down for another nap depending on whether he was up in the night, which lately he has been a lot due to teething! eeeeks. If he doesn't nap we just sit and play with his toys or read some books. Luka always has his breakfast at 9am without fail, he gets grumpy if I'm late giving it to him. At the moment he loves Strawberry Porridge, Banana Museli or Weetabix with fruit, these are so easy to make and they really do give him plenty of vitamins for his diet and energy for the day ahead. I always mix his breakfast with milk and he drinks water alongside his food. If he doesn't fancy a big breakfast he loves Jam on toast - which is what he settled for this morning! If he hasn't napped before having his breakfast Luka will always have a nap after, which is great for me because i can get all the housework done and have time to sit down and eat whatever I'm having for my breakfast. He usually naps for around an hour again depending on how much sleep he had in the night. I usually make Luka's lunch between 12 and 1 depending on how long he naps for, we are currently trying so many new foods so I will either cook some chicken with potato and veg, tuna pasta, or some sandwich fingers with crisps and fruit. He is really enjoying new food and is obsessed with BBQ sauce! He will then have a Yoghurt or a snack bar for pudding. After Lunch we will usually go out, now Luka is walking it's pretty much all he wants to do, so I take him on walks to the park or places he's never been and he loves to explore, it's also a great time for him to get a good amount of fresh air to tire him out for the evening. Luka will then have a small nap which is enough to give him an energy boost until bedtime. Around 3am Luka will start to get peckish, he's very indecisive about whether he wants a bottle at this time now, sometimes he will drink it all other times he doesn't want any so I think he may drop this feed so, he does however love to have a snack at this time, whether it be fruit, crisps or a snack bar which seem to be his favourite at the moment. Once he's had his 3pm bottle, we start our 'afternoon downtime' this is where we start to wind down a little bit ready for the evening. Usually we'll play with his toys or cuddle up in the cosy corner and read lots of books up until teatime. This is my favourite time of the day with him and he's a lot more settled. We then go into evening routine mode and start thinking about whats for tea. So that's pretty much it for a basic day in our lives, I will have a nighttime routine coming soon, and also an activities for children one coming too, I hope this helped anyone who isn't sure on what kind of routine a baby is in at the 1 year old mark, but remember all children are different and their routines will change constantly, as long as you are doing the basics you can't go wrong!